(Documentary, India, Subtitled) A journey with the traveling cinemas of India, which bring the wonder of the movies to faraway villages annually. Seven decades on, as their lorries and cinema projectors crumble and film reels become scarce, their audiences are lured by slick digital technology. 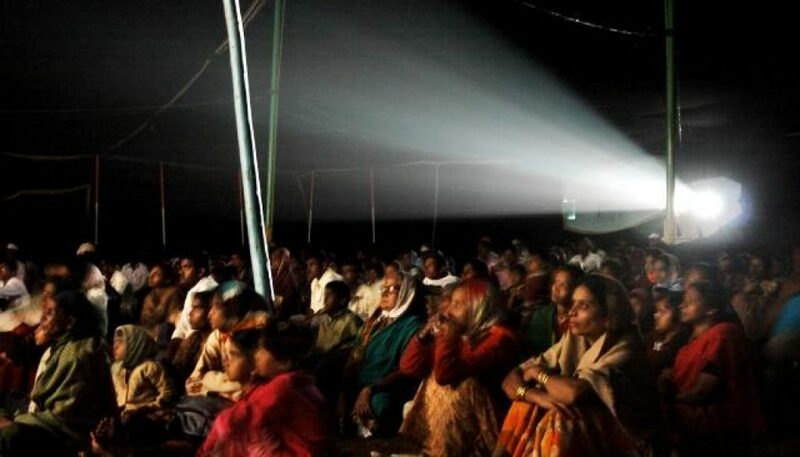 Showmen riding cinema lorries have brought the wonder of the movies to faraway villages in India once every year. Seven decades on, as their cinema projectors crumble and film reels become scarce, their patrons are lured by slick digital technology. A benevolent showman, a shrewd exhibitor and a maverick projector mechanic bear a beautiful burden – to keep the last traveling cinemas of the world running. Shirley came to love the movies because she was prohibited to watch them. There used to be a movie on television on Saturday night but the children were bundled into bed for the Sunday church service. She was scared to be on the wrong side of angels when they separated the wicked from the just on Judgement Day. The first film she saw happened to be ‘The Angel’. She was watchful, covering the television screen with a dark cloth and peeping in, so the escaping light wouldn’t betray her. The film showed her the benign side of the angles that the Bible had warned her against. Interested in how cinema can give form to the many faces of the human imagination, Shirley began to make movies. She has directed documentaries for the Guardian, Al Jazeera English and Doordarshan India. Her work is supported by the Sundance Institute, Bertha Foundation, Filmmaker Fund, PMA WorldView and Asian Cinema Fund. She has been a fellow of the Sundance Institute, Cluster of Excellence “Asia Europe in a Global Context”, Goethe-Institut and TasveerGhar. One winter night, Amit sneaked out of his grandparent’s home in the village. They were screening a movie in the school’s courtyard to celebrate a wedding. He crawled inside the white wedding tent to find his friends, plumes of smoke, and a huge screen lit with images. In the morning, Amit’s grandmother found him sleeping, wrapped in the lose flaps of the tent. She pulled him out of the swathes of canvas and touched his forehead for signs of fever. He was fine and was punished for his indiscretion. All afternoon, Amit worked on compost being prepared to plant mango saplings. Since then, Amit has found the musty smell of the compost indelibly intertwined with his first memories of cinema, rooted deep in his grandmother’s mango orchard. Amit Madheshiya is a photographer and filmmaker. His photographs have won awards from World Press Photo and World Photography Awards, and have been shown in solo and group exhibitions worldwide. He is a fellow of the Sundance Institute, Goethe-Institut, India Foundation for the Arts, Arts Council of England and the University of Heidelberg. Shirley and Amit founded Cave Pictures in 2015. The Cinema Travellers is their first feature length film production.